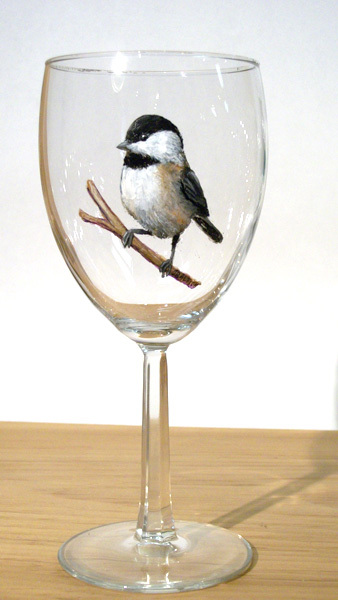 Join senior artist Joe Baltich at Into The Brush for Micro Art Classes at Northwind Lodge. Micro Art Classes are for people to see if this whole “painting thing” is achievable or not. So far, I’m going with “Yup.” for the vast majority of people. Each class is about 2 hours long and held at Northwind Lodge / Red Rock Wilderness Store on the Fernberg Road. 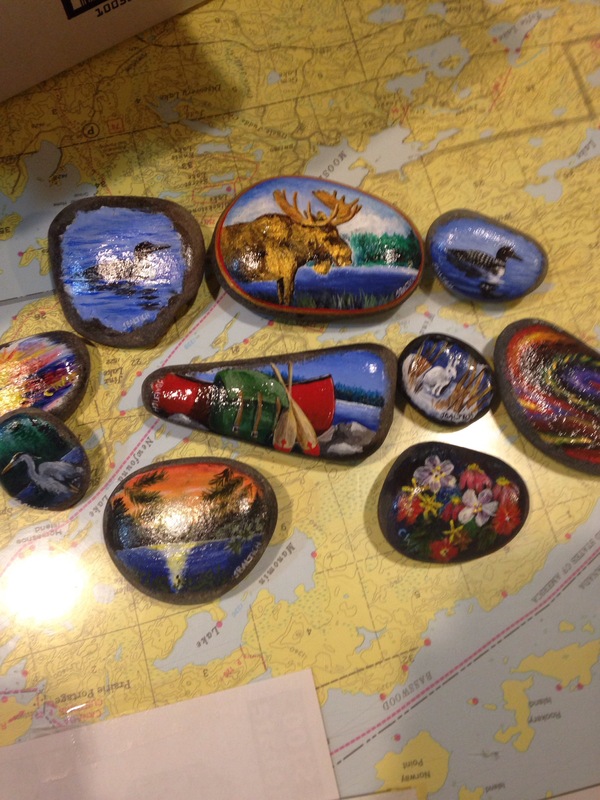 Paint a Lake Superior Rock in this “follower the leader” art class where you will get to test your skills and maybe discover a passion for painting. 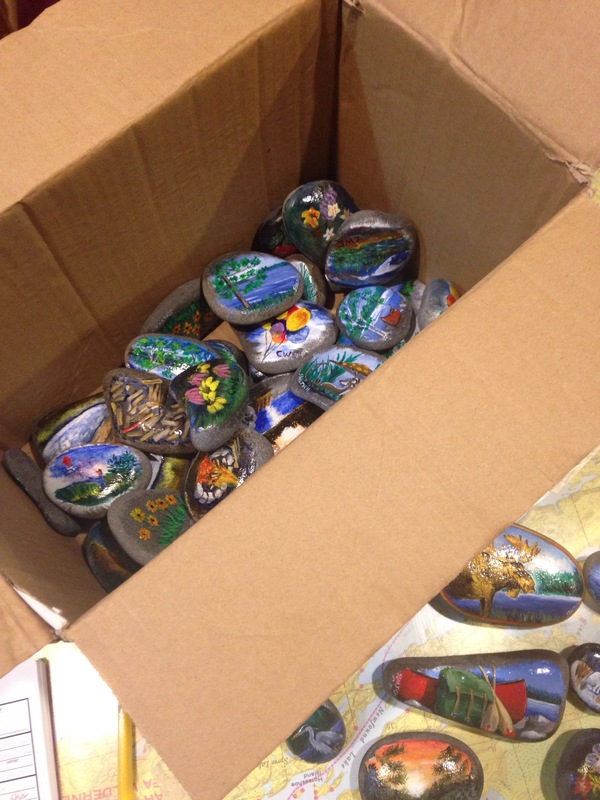 All materials are provided including a Lake Superior rock, acrylic paints, brushes and instruction. Learn basic brush handling skills and blending by simply doing. It’s fun, mildly challenging, and you get to take home a rock that should have more than one color on it by class end. Cost is $35 per participant. Recommended for ages 12 and up. Reservations for seating are required. Please call for availability 218-365-4512. If you are all thumbs, please wear clothing that could get a little paint on them. Don’t come in like a rented tux or anything like that. Dierdre V. with her work of art. The work of a first-time artist! Into The Brush is a non-profit program based at Northwind Lodge to help people learn to paint by discovering the wilderness of Ely, Minnesota. Our goal is to introduce all walks of life to our wilderness through art education. At program’s end, participants will have a developing new skill set, confidence, and a knowledge of the most beautiful place in the world called Ely Minnesota. We hope to encourage you to participate in our regular summer programs and/or donate to help more people develop this life-long skill of painting beautiful things. A “Donate” button is at the top of the page. Your donation will go towards art equipment purchases and operating costs to run Into The Brush.